A team of scientists from the University of Rhode Island and the Charles Darwin Research Station exploring the seafloor northwest of the Galapagos Islands in 2015 made an unexpected discovery. Large numbers of egg cases of a deep-sea skate – relatives of sharks and rays – were observed adjacent to the hot water emitted from hydrothermal vents, which the scientists said the skates use to accelerate the development of the embryos. It is the first time such behavior has been recorded in marine animals. The discovery is published this week in the journal Scientific Reports. Brennan Phillips, URI assistant professor of ocean engineering, was leading the operations team of remotely-operated vehicle operators during the expedition to explore the underwater mountains around the Galapagos. He said they didn't recognize the significance of the aggregation of skate eggs until much later. "We were on a really deep dive in a hydrothermally-active rift valley, with walls 30 meters tall on either side, and the ROV was meandering back and forth looking for vents," Phillips explained. "We started noticing all these egg cases, and we recorded their location and collected a few but then just kept going." 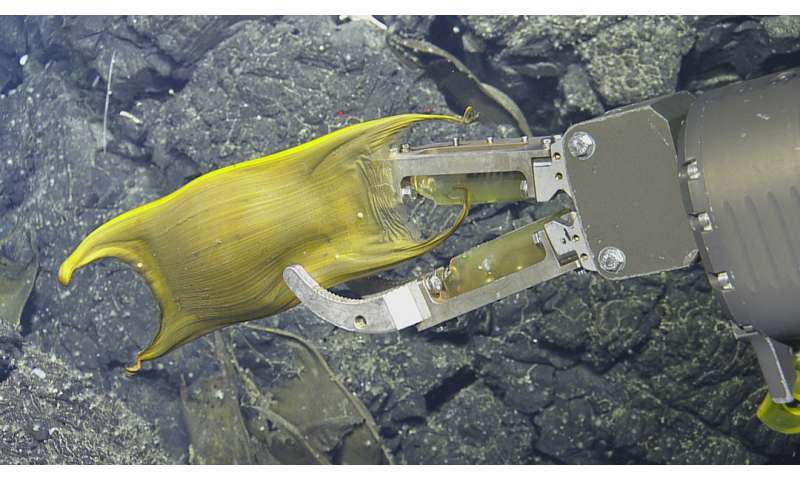 Later, when the egg locations were analyzed and compared to hydrothermal vent locations and recorded water temperatures, the scientists concluded that the eggs were likely intentionally placed by the skates where the water was warmer than average. In total, 157 mobile-phone-sized egg cases were observed, which DNA analysis revealed to be from the Pacific white skate (Bathyraja spinosissima). About 58 percent of the egg cases were found within 20 meters of a black smoker, the hottest kind of hydrothermal vent, and 89 percent of the egg cases were laid in water that was hotter than the background temperature of 2.76 degrees Centigrade. "The eggs weren't right next to the active vents, because the water can get so hot – hundreds of degrees – that it would kill them," Phillips said. "We found most of them in the lukewarm water not far from the vents and near some extinct vents. "The kicker is that we showed our data to a bunch of shark experts, and they had seen anecdotal evidence of shark and ray egg cases near hydrothermal vents, but they never had the data to put the story together," he added. Several land animals have been recorded laying their eggs in similar situations. A rare bird native to Tonga, the Polynesian megapode, often nests in volcanically-heated soils, for instance. Fossils of some sauropod dinosaurs of the Cretaceous era are believed to have done so as well. This isn't the first time Phillips has observed unexpected behaviors by shark family members in heated water. In 2014, he investigated an underwater volcano near the Solomon Islands in the western Pacific Ocean, where he watched several species of shark swim right through the bubbling hot water in the volcano's crater. "Our cameras caught images of schools of sharks, smaller fish and even jellyfish living in the hot acidic plume," he said at the time. "This presumably toxic environment supports a whole community of life, even though every once in a while it blows up." Coupled with his hydrothermal vent observation, Phillips believes that sharks, rays and skates – which evolved about 500 million years ago – have adapted to the unusual conditions. "Seafloor volcanism comes and goes, and it is often one of the causes of mass extinctions," he said. "It's interesting to me that we're seeing sharks and skates thriving around volcanoes and vent sites, like they're especially resilient and have evolved to withstand the hot water environment."